IP54 Weatherproof With the IP54 weatherproof design, the radio withstands the effects of rain, snow and other weather conditions. 22 Channels each with 121 Privacy Codes With 22 channels and 121 privacy codes, totaling 2,662 combinations, it is easy to find an available channel. Know The Weather In Advance Keep updated with real-time weather conditions by turning on the weather channel or initiating weather alerts. With these capabilities, you will always be prepared for the unexpected. NOAA radio service may not be available in all areas. Check with your local weather office for frequency and details Light Your Way The built-in LED flashlight gives you peace-of-mind during evening adventures, unexpected emergencies or power outages. Power Through Your Adventures There are two ways to power your radio. You can use NiMH rechargeable batteries included for up to 8.5 hours. Or use 3 AA batteries on the go for up to 21 hours. There are three ways to charge the NiMH rechargeable batteries. You can plug the micro-USB cable to an outlet, connect it to your vehicle adaptor, or to your computer. Be Hands-free When hiking up a steep mountain trail, keep your hands free to brace the rocky terrain. With iVOX/VOX acting like a speakerphone and allowing hands-free communication, you can keep on moving without stopping to answer a call. Customize Call Tones Choose what your callers hear before you start speaking by selecting one of the 20 call tones, including animal sounds and ring bells. Keep It Private The Quiet Talk (QT) feature ensures uninterrupted communication with other Motorola radios that also have this feature. 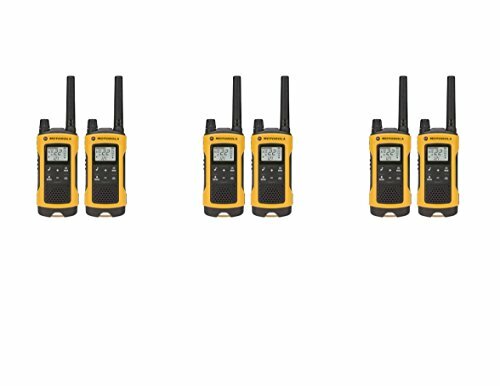 Filter out unwanted transmissions from non-Motorola radios in heavy traffic areas such as ski resorts or amusement parks. Compatible With Any Radios You can communicate with other FRS/GMRS radios regardless of brand by being on the same channel and privacy code Eco Smart Most of the energy wasted when using a mobile device occurs during the charge.